In the fourth of a series of stories about Singaporean homes in the past decades, we delve into Amanda’s campur-campur (“mix” in Indonesian) mix of interior styles—a fascinating combination of both Asian and contemporary European from both heritage and past homes. The late '70s was, according to Amanda, a golden era for her mother—a time when ABBA and The Carpenters rocked the global stage, disco pants sparkled in bellbottomed glory, and a bolder lavishness crept into home interiors. When Mrs. Tan Yu Yen, 63, moved into their current home in 1983, these elements were weaved into her furniture and decor choices along with an embroidery of Asian and European influences. These influences stem from a childhood housed in various countries, including a Bauhaus-style home furnished with Chinese wood and batik paintings, and different contemporary European interiors. It is from this campur-campur mix that Amanda’s family history can be sketched out, painting each individual’s experiences and character into a richly textured canvas. “It is kind of an homage to our own history, with my Grandma being from Germany, and my Grandpa being from China, as well as having lived as residents in Indonesia and Singapore for a long time,” Amanda says. Compared to her own parents, Mrs. Tan preferred cleaner lines and less ornate pieces. Modernity also followed her along with the trends of the late '70s and '80s. “My mum is a simpler decorator than my grandma, and she doesn’t like clutter, so she likes things neat and compartmentalised,” she shares. Simpler perhaps, but the mix of interior styles remain eclectic, with Oriental paintings and Balinese rattan chairs nestling between lush velvet sofas and French-styled dining chairs. The French-style dining chairs were a trickle-down, remnant of her grandmother’s preferences. Amanda describes her grandma to have “loved literature, fashion, fine jewellery and interiors. She had a passion for both European and Chinese influenced literature as well, from the time I’ve spent with her bookshelf.” When it was time to have them replaced, Mrs. Tan even had the same chairs remade in a cream and light brown. In addition to these Oriental paintings, Amanda’s mother hangs her own batik and homemade needlework on the walls. I guess that’s her way of ornamentation with her own touch,” she says. Then and now: A birthday party when Amanda was a toddler; a Christmas tree in recent years. Christmas holds the most significance to Amanda’s family, with air-flown caviar, foie gras and a whole turkey making their appearances. There are family traditions that stay through generations—for example, Christmas remains a huge occasion for the Tan family, which Amanda attributes to their German descent. Besides the traditional Christmas tree, their home would see festive tablecloths and pillow cases, snow-flake stickers, and fresh flowers amidst gold pinecones and red holly berries. Mrs. Tan’s collection of crystal tableware adds an extravagant touch to the decorations. And yet like the growth of an individual, the fluid nature of their family heritage builds upon a core more long lasting to slowly incorporate the present and future. Even for Amanda’s family, additions and changes are not overdone, but rather as “a touch here and there to add a little bit of ourselves into the home." The velvet sofas were reupholstered in modern materials, but retains the same frame from three decades ago. The same cupboard-seater can still be found in Amanda’s home today. “I guess the things that have been around the longest are the things I’d have a hard time letting go of. For example—the velvet sofas and our dining table and chairs. I think they’re beautiful, I’d have them in my own home in the future,” she says. Have any memories to share, or know of any houses you want us to feature? Email us at hello@cromly.com! 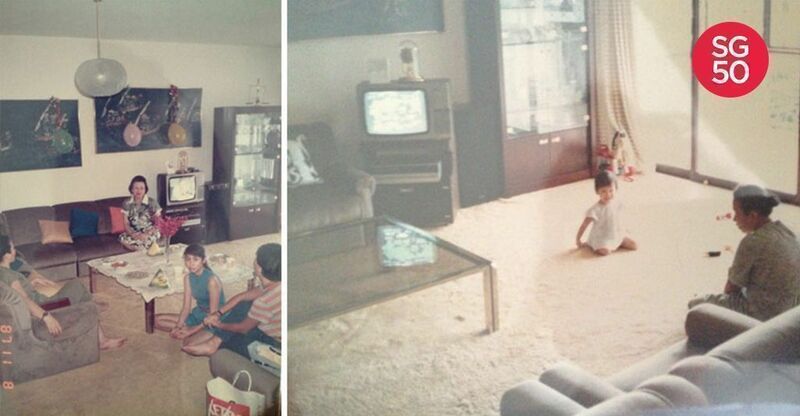 You can also visit our interactive microsite that features the Singaporean home in the past five decades.